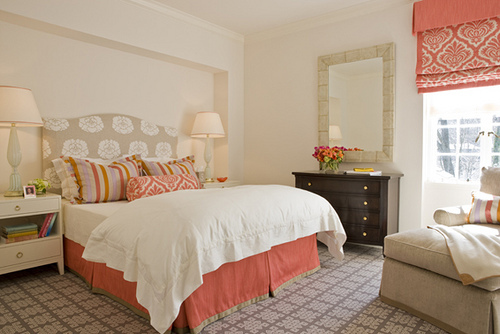 keep it light and fresh...this is a room i could easily take a summer Sunday nap in that beautiful vintage style bed. though this room is a little more autumnal then above, it's still light and airy. the bed is a little too streamlined and flat for me... first thing i'd do is add a plush down comforter. now we're talkin'! even if you don't live on the beach, you can have practically here the waves crashing in a room like this without having to put starfish and buckets of sand all over the place. it's the colors, patterns, and natural textures that make this room feel so clean. it's all in the details. check out that lamp base! this is a far more gender neutral option, maybe even a bit "manly" but the colors are warm and rich, and the decor is very simple. this look would be very easy to achieve. think warm wood tones, neutral bedding, and an old ladder. okay, the ladder may seem difficult to find but as long as you don't have little ones who will climb it, you can make one from two 2x4x8 pine , a couple of large dowels, and some wood stain. it's easy, i've done it. if you know me, you know why i love the above picture. color color color! these are a little more muted than i would normally pick but they're very soothing and bedrooms are meant to be relaxed in. yes, this is super neutral. yes, it is rather cozy. just look at the bedding! yes, i'm wondering where all the color is hiding. and yes, i realize that sometimes turning down the color is the right thing to do. at least they've boosted the pattern!